We are now accepting applications for Certification. Click here for the Certification Application Form to apply. Please note that all supporting documents should be mailed by Canada Post. Please do not send them via courier as courier services will not deliver to a PO Box. If you are unable to send your documents via Canada Post please contact the Certification Board Chair. The date of the next Certification Examination will be Friday, August 16, 2019. The University of Montreal has been granted Pathway C status for the 2019 and 2020 examinations. 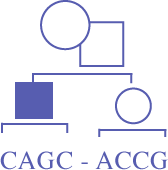 Genetic counsellors who have graduated in 2018, 2019, and 2020 from the University of Montreal can apply to write the 2019 or 2020 Certification Examination through a streamlined Pathway C.
The Canadian Association of Genetic Counsellors (CAGC) is committed to ensuring that individuals seeking genetic counselling services in Canada are receiving these services from an individual with a high level of competency. The process of certification and recertification has been adopted by most professional organizations as a mechanism for assessing and maintaining the knowledge and skills of its practitioners. The CAGC certification process consists of a certification exam, which will be offered on an annual basis starting in 2019. Eligible candidates must demonstrate that they have been significantly involved in the evaluation and counselling of patients seeking genetic information and that they have the experience and expertise that is attributed to genetic counsellors. The CAGC Knowledge-Based Competencies is the basis for CAGC Certification Board exam questions. Eligible candidates may apply through one of six pathways. Candidates are responsible for completing the correct application forms in order to be considered. Detailed information regarding the application requirements for each pathway can be found in the Certification Handbook. Please note that there have been changes to the logbook requirements for Pathway A applicants. Please review the Certification Handbook closely to determine if you require a logbook. Candidates will be contacted by email regarding their application eligibility to sit the examination and with their examination results. Certificates will be mailed to successful candidates. Questions regarding the certification process and completed applications should be directed to the Certification Board Chair.